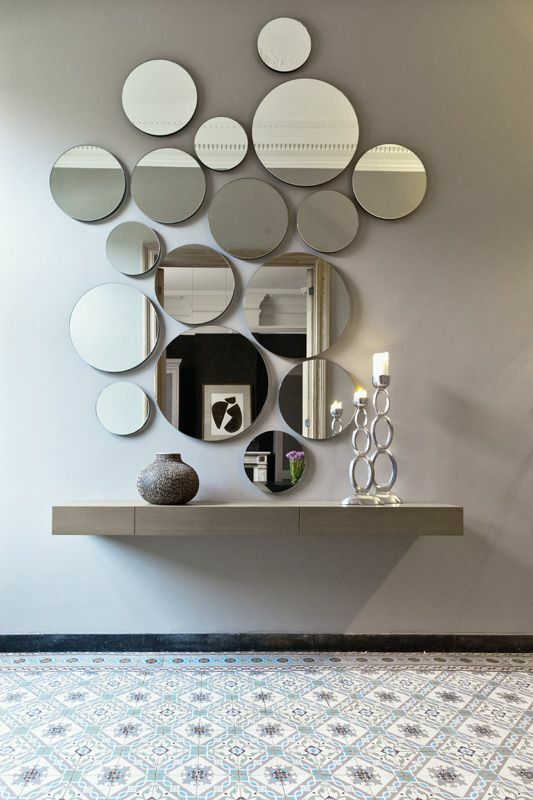 A large mirror in a small room creates the illusion of depth, so don’t be scared to go big! 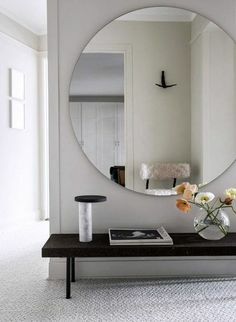 DON’T place mirrors at random around your home. 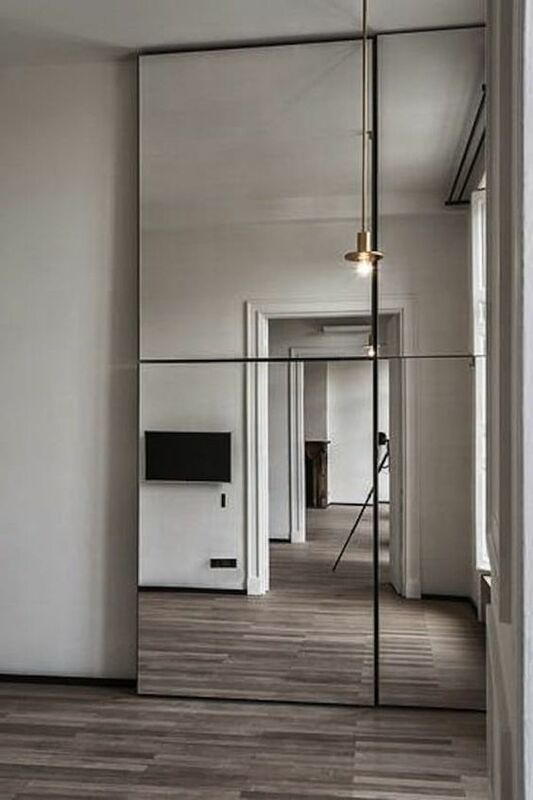 It might be tempting to hang up a mirror to cover empty wall space, but make sure it’s reflecting something that’s worth looking at. 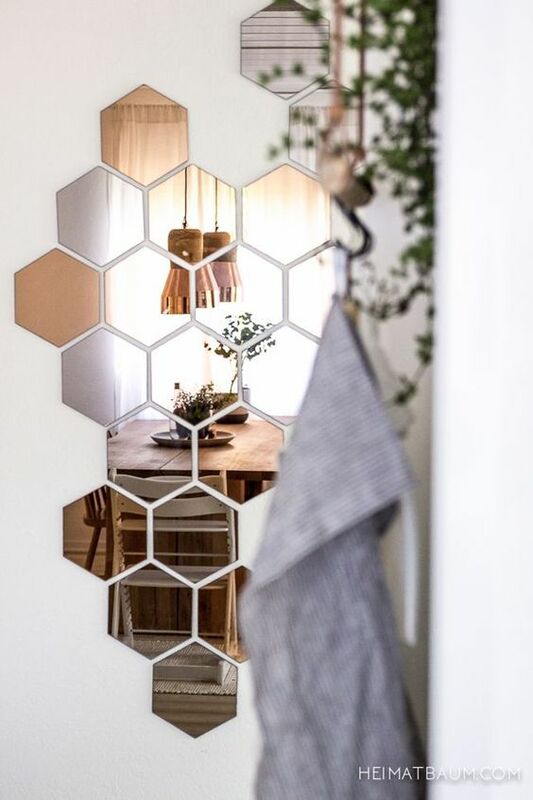 The worst thing you can do is hang mirrors so they’re reflecting random things in your home. 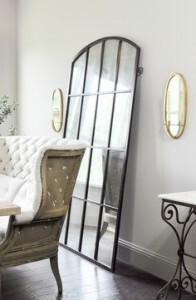 For example, you’d never want to place a mirror in a spot where it could reflect a pile of clutter, or even an unattractive piece of furniture! 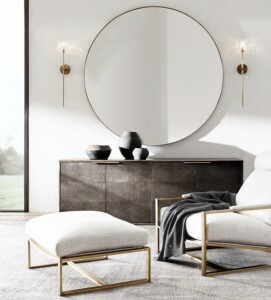 You want a mirror to reflect a nice view, light, piece of art, wall texture or furniture. 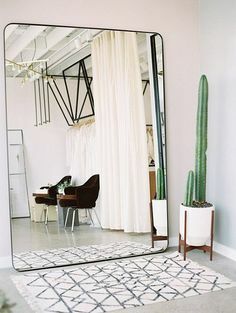 “I absolutely LOVE a mirror leaning against a wall. It looks so effective and makes a great focal point. If you really want to up the ante, place a spotlight behind it, thus creating a nice glow behind it. 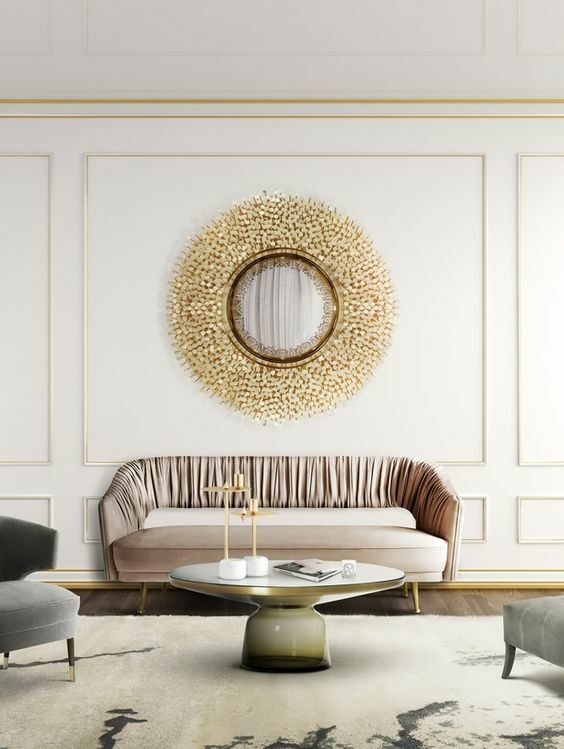 One bold piece or a grouping, can set the entire tone for the room. Mirrors are not necessary in a kitchen. 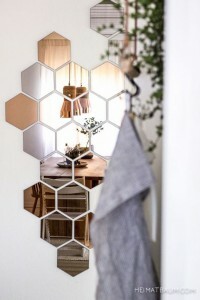 Even tho I have once used a mirror as a splashback in a kitchen, (and it looked amazing!) 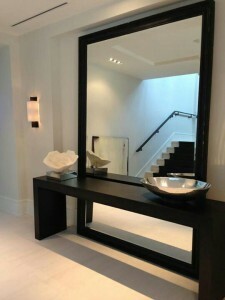 I wouldn’t recommend using a mirror in this room as it would need constant maintenance with regards to water marks. 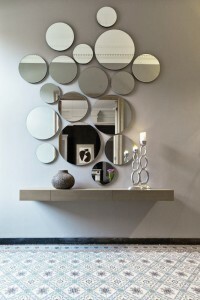 I would also be careful with placement of mirrors in dining rooms – there is nothing worse than watching oneself chew! 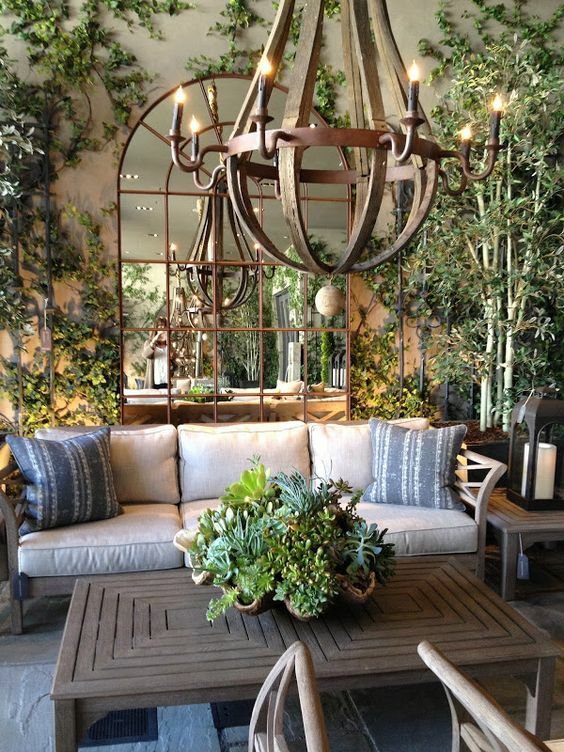 Remember that some spaces can really benefit from mirrors such as your outdoor patio, as this really helps create the feeling of it been an indoor room. Read more about that here. A smaller, horizontal mirror works in a narrow passage or staircase. 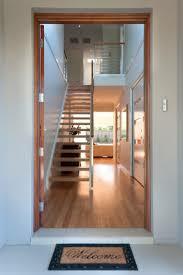 This will act to widen the space, which creates a better flow from room to room. You just need to take a stroll thru your closet shopping mall to see that Pink is a big trend when it comes to fashion at the moment. Worried that this colour might be a bit too “Barbie dolls” bedroom for you? 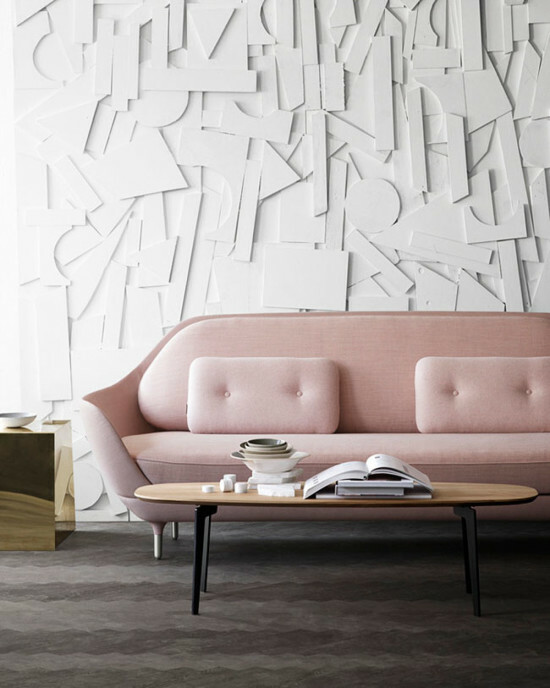 Here are some ideas on how to bring pink into your interior that is adult-like, sophisticated and cool. 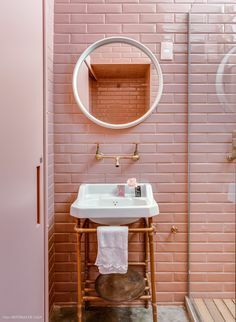 Personally I think the key to pulling off pink in an interior is what you pair it with. 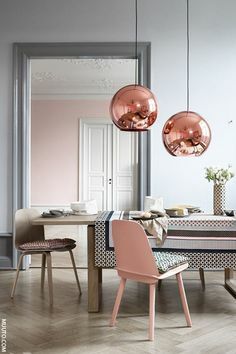 Pairing pink with brass or gold accents always looks good. 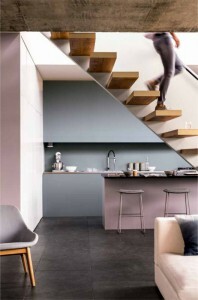 As does contrasting it with a dark colour such as a navy blue or deep moss green. And of course my fav charcoal! 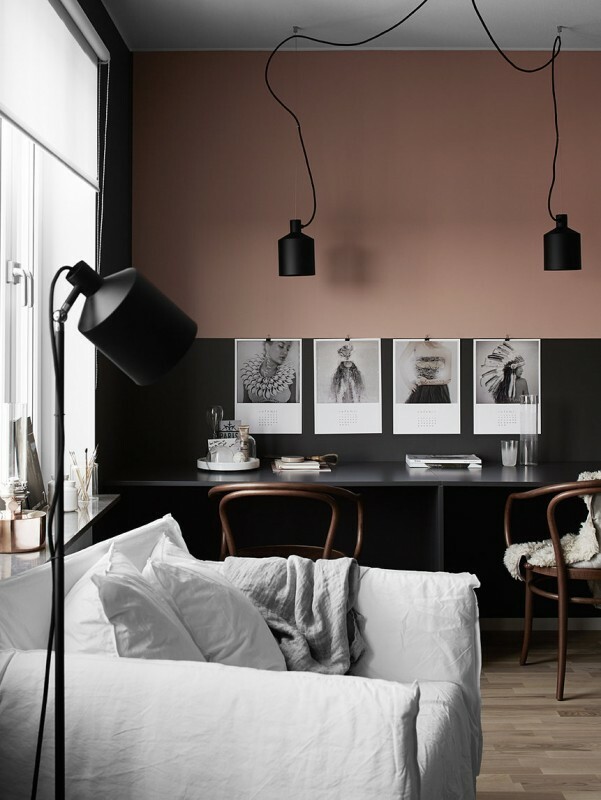 BLUSH AND CHARCOAL IS A WINNING COMBINATION. 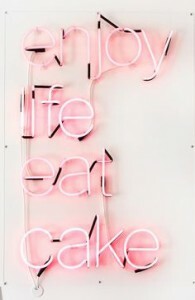 JUST LOVE! Adding pink in a small space such as on the wall in your entrance hall or guest loo makes a statement without too much investment. Here you can go intense with the colour or pattern as you don’t spend too much time in the space, and it really ups the ante on the wow factor – two areas which you want to do just that! 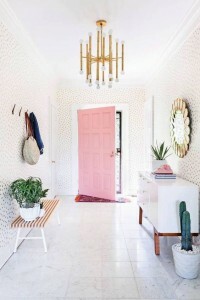 I LOVE THE IDEA OF A PINK DOOR! 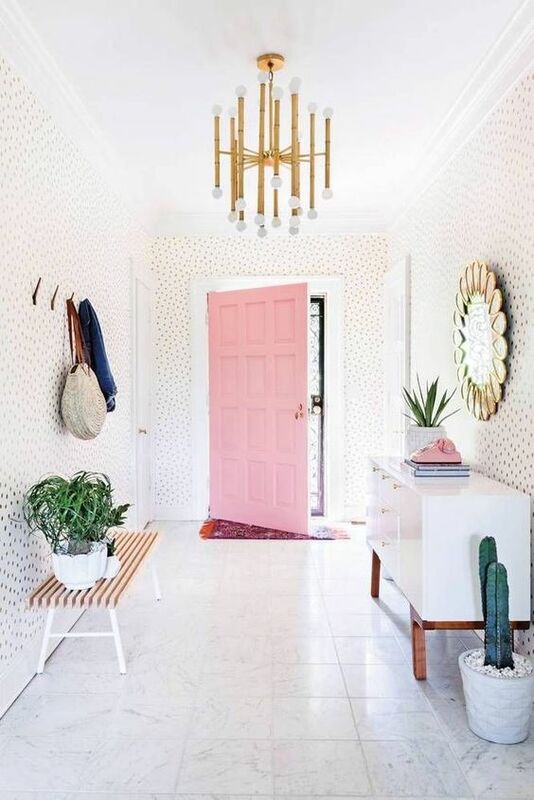 A PALE PINK PATTERNED WALLPAPER IN THIS ENTRANCE HALL WITH A PINK DOOR! 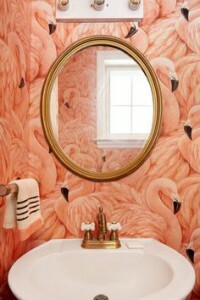 PINK AND FLAMINGO’S! TREND OVERDOSE HERE! 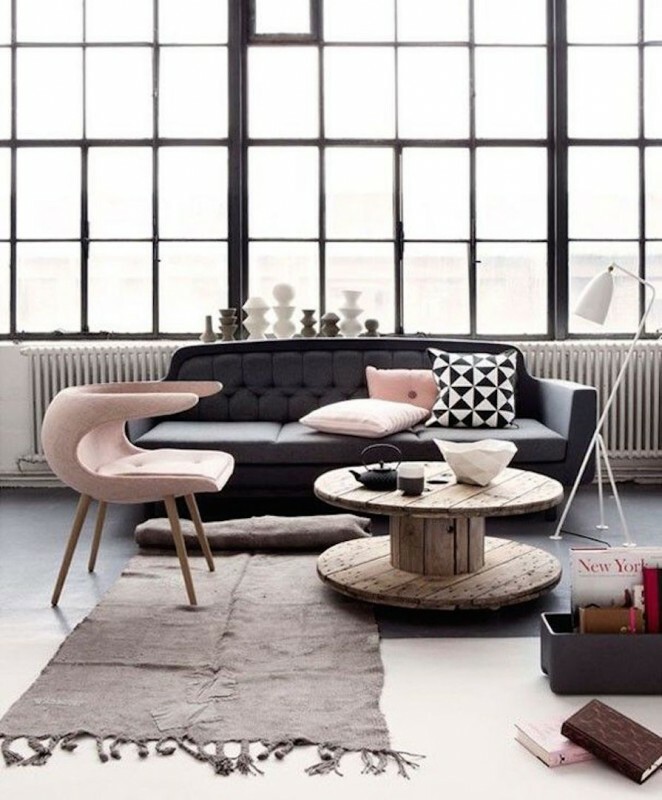 For a really quick and easy fix, bring in pink with new accessories. Whether its crockery on display in your kitchen or a gorgeous pendant light, this is a simple way to adopt this trend and less permanent too. 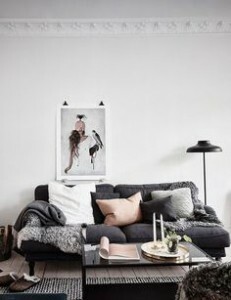 Scatter cushions of course are another way to bring in blushy hues, that can easily be replaced next season. 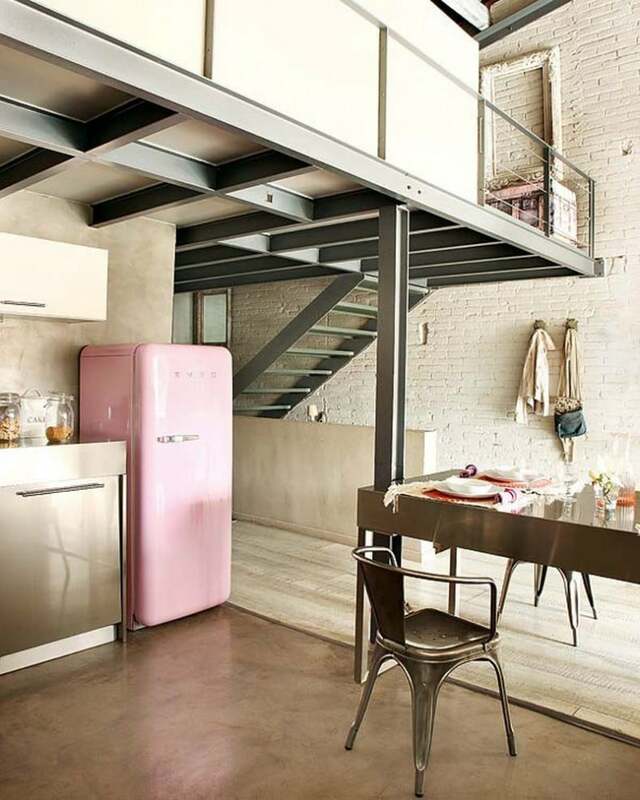 EVERY INDUSTRIAL LOFT NEEDS A PINK SMEG FRIDGE! 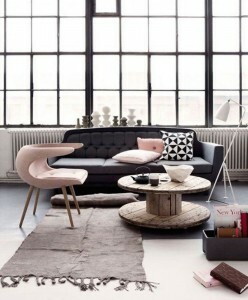 For a more dramatic look, incorporate pink on larger pieces of furniture. 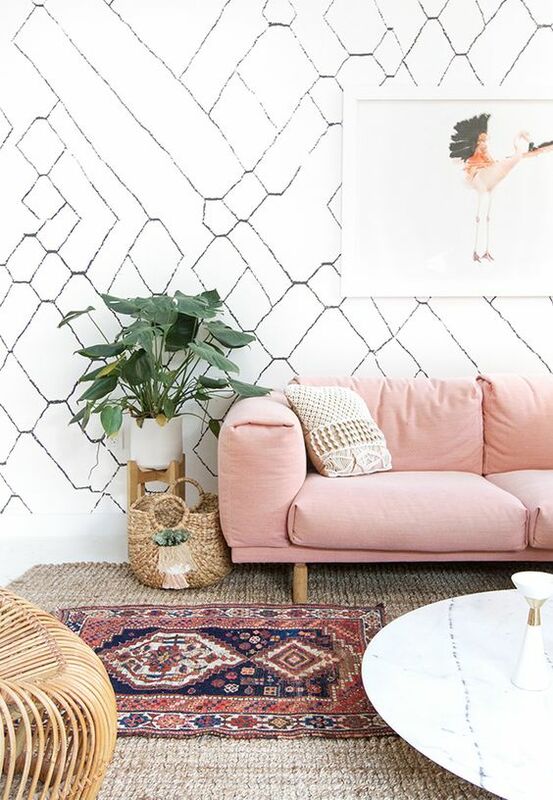 In a beautiful fabric, a couch becomes a beautiful feature. 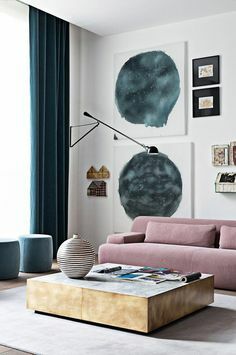 A contemporary interior with strong, bold lines is the best to pull of large amounts of pink as the masculinity of the space I think balances out the femininity associated with the colour. 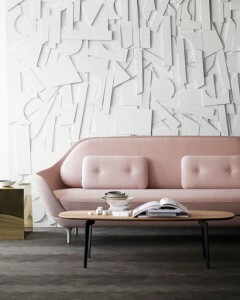 I also think contemporary lines help make pink feel fresh in a space. I would have to say, my favourite shade: candy pink on my lips, and a soft blush paired with charcoal in an interior!